New details have emerged about the intense aerial battles that ensued on December 7. However, most accounts focus almost exclusively on what happened to the U.S. Navy on Pearl Harbor. In “Infamy in the Air,” Tom Yarborough’s fascinating look into the Pearl Harbor attack, you’ll learn all about the drama surrounding the air-to-air battles and dogfights that also ensued. The aerial saga actually began around 6 AM on December 7, as Commander Minoru Genda, principal planner of the Japanese mission watched anxiously aboard the carrier Akagi as his close friend and Eta Jima Naval Academy classmate Mitsuo Fuchida led the first wave of aircraft into the gray dawn. Confidence permeated the thoughts of the Japanese strike commander, and as he flew south in his Nakajima B5N2 Kate bomber, a flamboyant Fuchida wore red underwear and a red shirt, reasoning that blood would not show if he were wounded and therefore not demoralize the other fliers. 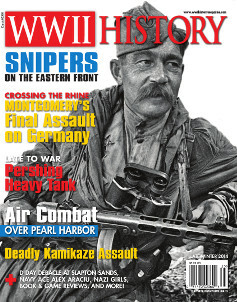 This special feature in the Late Winter edition of World War II History Magazine reveals some new sources, both American and Japanese, that clarify and in some cases, alter the previously believed notions about a few iconic episodes, a handful of airmen who fought, and the American heroes who willingly flew into the sound of battle and their tenacious enemy. These details add a vital mission dimension into the long-established history of the Pearl Harbor attack. In “A BDM Girl Comes to America,” you’ll learn all about a young German girl who was enrolled in a Nazi youth organization, but survived the war and made her way to the United States. “The Final Offensive” by David Lippman covers the German resistance in northern Europe as it crumbled in the spring of 1945. In “Training Stalin’s Sharpshooters,” you’ll follow along with hopeful Soviet snipers as they learn their trade before taking to the Eastern Front against German blitzkriegs. “Holding the Picketline” by Mike Haskew details the USS Hugh W. Hadley’s conflict with a series of kamikaze attacks off Okinawa. What do you think? Have the air-to-air battles during the Pearl Harbor attack received their due attention in film and in print? Or is there indeed more to the story? Let us know what you think in the comments below. Tags Blitzkrieg, blitzkriegs, Eastern Front, Europe, Features, Franklin Roosevelt, German, German Blitzkrieg, Japan, Japanese, kamikaze, Nazi Party, Okinawa, Pacific, Pearl Harbor, pearl harbor attack, South Pacific, surprise attack on pearl harbor, The Eastern Front, the pearl harbor, the pearl harbor attack, United States, USS Hugh W Hadley, World War I, WWI, WWII.